of when I was attending Johnson & Wales University almost every party with my sorority sisters included Funfetti Cake! Yes it was the box mix from Pillsbury. One sister, Diana, made this for every birthday, ok, just about every time we all got together. We were all like little girls again eating the cake. Just opening the bag of the cake mix was intoxicating! I think it was also around this time when Cake Batter flavored everything (ice cream, shakes, lipgloss, body spray) came out. I finally got the formula right! Believe me it took some time, just ask my husband ? I hope you enjoy! The recipe is in Metric Form. I took a commercial recipe and played around with the formula. In the recipe I use vanilla sugar- I have an airtight container filled with vanilla beans and sugar to make the vanilla scented sugar. If you don’t have this regular sugar will be fine. I also use one whole egg and a little bit of egg white from another egg. 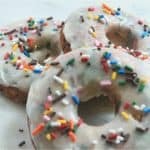 These doughnuts are so addicting just like the box cake mix you know and love. Mix all of the dry ingredients, except for the sprinkles, in a bowl. Reserve. In the bowl of a stand mixer, with the whip attachment, mix together the eggs, coconut oil, butter, and milk for two minutes. Add dry ingredients and mix for an additional three minutes. Be sure to scrape the bottom and sides of the bowl. Fill doughnut pan wells 3/4 full. I like to use a piping bag when filling the doughnut pans. Allow to cool for 5 minutes in the pan and then place them on a rolling rack. Cool completely. Place the confectioners’/icing sugar, salt, vanilla, and hot water in a large mixing bowl or in the work bowl of a stand mixer fitted with the paddle attachment. Using a whisk, or with the machine on low speed, blend until the mixture is smooth and all of the sugar has been incorporated, scraping the sides of the bowl with a rubber spatula if necessary. If the glaze seems too thick, add more hot water, a teaspoon at a time. To glaze, dip one side of each hot doughnut into the warm glaze, and let dry for 10 to 15 minutes before serving. Dip cooled doughnuts into the glaze and sprinkle each doughnut with sprinkles. Allow to dry about 5 minutes. They look great! I am such a sucker for cake flavored everything! Thanks for sharing at #HomeMattersParty hope to see you back! The funfetti doughnuts are so good!